I have a rather conflicted relationship with intimate open-kitchen restaurants. At their best, for example in Japanese style sushi bars, they offer the ultimate host-guest experience, allowing a chef to tailor the pace and content of a meal on an invidivual level and giving the customer an intimate view of the skill and technique that goes into the making of their dinner. Served blind, the food at Sushi Tetsu would still rank amongst the finest Japanese food in the capital, but seeing it prepared before your eyes with such balletic skill and artistic flair lifts the experience to another level. And then there are the open kitchens where perhaps I don't want to see precisely every raw detail of what goes on in the making of my dinner. The thing about sushi bars is that most of the boring and ugly prep goes on behind the scenes; all you see as a diner is the last chapter, the beautiful final few strokes of the brush. There's an aesthetic magnificence in the preparation of sushi, it needs to be seen. What I don't need to see is tupperware being opened, clingfilm torn apart, piles of waste being shovelled into black bin bags, handfulls of blue roll being used to mop up smudges and spills. These things subtract from the joy of eating, not add to it. So with that in mind, there are certain fascinating things to be seen sitting at the bar at Padella. These certainly include the almost forensic care and attention that goes into the making of the pasta, a skill which surely ranks right up there with Japanese noodle mastery. Watching the chefs at Padella gently tease apart a clump of pasta into the individual boiling cages, taste the water for seasoning, then eventually transfer the pasta to a pan, teasing the liquid back and forth to capture just enough of the precious pasta water, all this is a joy to behold, something entirely new to me and which undeniably enriches the experience of eating at Padella. But when I order a beef carpaccio and watch someone grab a plate from the fridge, tear off the clingfilm and then hand it to me, well, not so much. I'm fairly sure there aren't many better ways of serving beef carpaccio in a busy kitchen I'm just thinking that had I not seen someone pull it out of the fridge a few seconds earlier I wouldn't have noticed quite how cold it was. Despite all this though, it was clearly very good beef, dressed in excellent oil and delicate crystals of sea salt. The pasta, though. Good lord, the pasta. 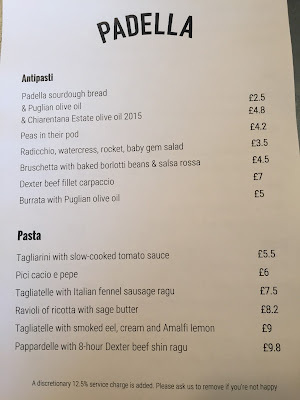 It's probably not a good idea to deal in absolutes but let's face it, when has that ever stopped me before, so I'm going to stick my neck out and say that the pasta at Padella is the best I've had the privilege to eat anywhere in Britain or abroad. Pici cacio e pepe was thick with a gentle give, silky with a perfectly balanced parmesan, black pepper and butter sauce and so intensely addictive when the last of it had disappeared from my plate I experienced what I can only describe as a profound sense of loss, a deep and ferocious longing for more pasta. Possibly this had something to do with the portion sizes at Padella being not quite on the right side of generous, but even so, this was exceptional pasta. Then ricotta and sage ravioli, utterly flawlessly executed pillows of fluffy, dairy loveliness, glossed with gently herby butter and topped with fresh shaved parmesan. It's hard to comprehend that the pasta at Padella could be improved upon in any way; in fact more than that, it's better than I ever thought pasta could be, enough to ensure I never order it from anyone else again lest I sully the memory of this one perfect pasta moment. Yeah, it's good. So I'm willing to ignore all the other annoyances - the cling film, the blue roll, the no reservations, the fact they saw fit to sit me right next to a stranger on an otherwise empty bar - because I would walk a thousand miles through rivers of molten steel for a chance to eat that pasta again and everything else is an insignificance. All I can suggest is you make the trip to Borough Market yourself and get in line. You think you've had pasta before? You really haven't. Chances are Padella will be in the next version of the app. But if you get there and the queues are too big, why not see where else round there is good. Did you have double pasta all on your own? Gastro1: it is Parmesan, they've just told me on Twitter. Sounds cool, someone try the bread please. Always looking for real bread. After living in Bavaria, most UK bread is so rubbish. Gordon has real bread in his restaurants. Please can other restaurants etc. do similar. Good pasta, yes please. On my radar for sure Thank you Chris. DAMN! I tried to go there for dinner last Sunday, but didn't know they closed early on a Sunday. I did use their toilet though. Now i'm kicking myself that I didn't get to try it. I'll certainly go soon after reading your review. I've had better pasta in Rome, but Padella are close. 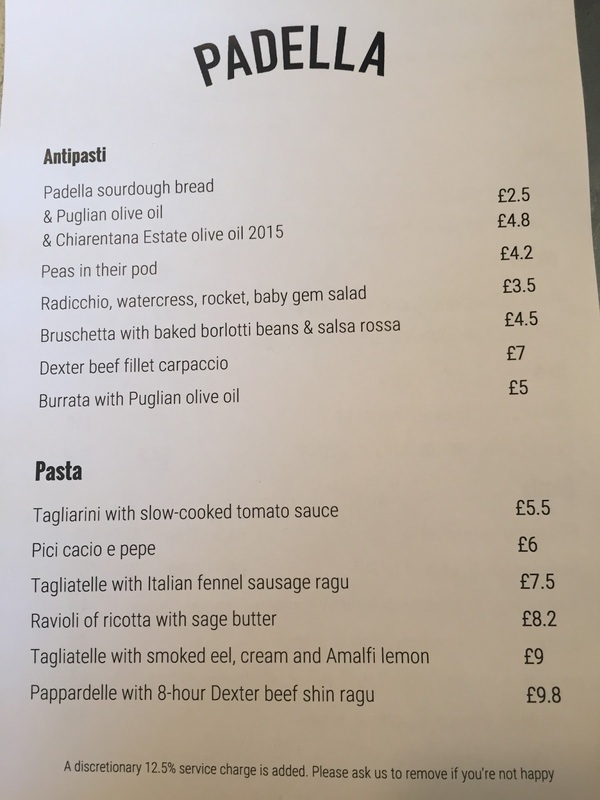 I went and also doubled up on my dishes - had the cacio e pepe (one of my favourite dishes to cook at home) and the pappardele with ragu. Would say that the former is indeed really good but the latter was pretty unremarkable, and also served less than hot (presumably because it was ready before the other dish). Also irritated by being kept in a short queue that didn't move for 15-20 minutes only to find that there were lots of empty tables downstairs - were they trying to maintain the impression that people were queuing to get into their cool new place so as to maximise walk-in custom? I won't be rushing back.